In this review, we will be comparing D5 and 645Z, two Pro DSLR cameras from Nikon and Pentax. Nikon D5 has a 21.0MP Full frame sensor whereas Pentax 645Z has a 51.0MP Medium format sensor. We can expect this to be a close match up because both models are ranked amongst the best in Pro DSLR cameras. Out of 34 cameras in this class, Nikon D5 is ranked #3 with an overall score of 85 and Pentax 645Z is ranked #1 with an overall score of 86. Let's have a brief look at the main features of Nikon D5 and Pentax 645Z before getting into our more detailed comparison. 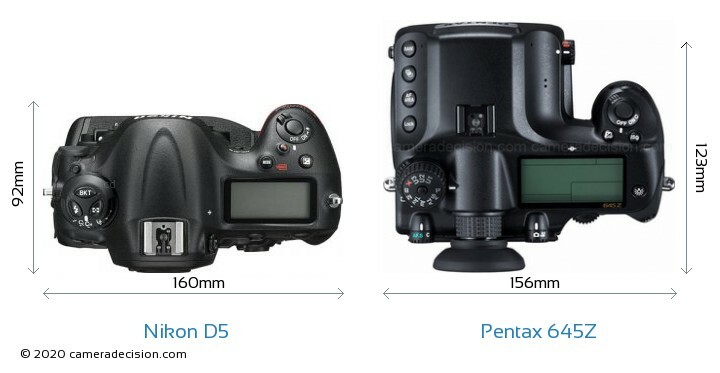 Below you can see the front view size comparison of Nikon D5 and Pentax 645Z. Pentax 645Z is 4mm narrower and 42mm shorter than Nikon D5 but it is also 31mm thicker. Now lets look at the top view comparison of Nikon D5 and Pentax 645Z. Weight is another important factor especially when deciding on a camera that you want to carry with you all day. Nikon D5 is 135g lighter than the Pentax 645Z but we don't think this will make a significant difference. Also keep in mind that body weight is not the only deciding factor when comparing two interchangeable camera bodies, you have to also take into account the lenses that you will be using with these bodies. Since Pentax 645Z has a Medium format sensor and Nikon D5 has a smaller Full frame sensor, Nikon D5's lenses for a similar focal length and aperture will generally be lighter and smaller than the Pentax 645Z lenses. 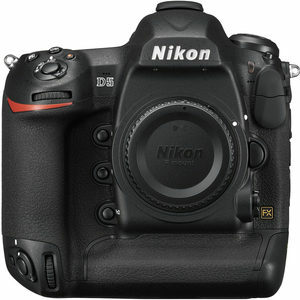 Nikon D5 has a 21.0MP Full frame (35.8 x 23.9 mm ) sized CMOS sensor and features Expeed 5 processor. 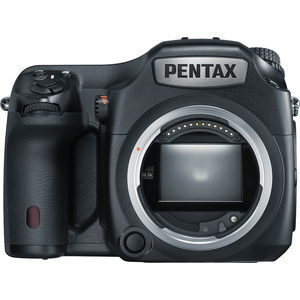 On the other hand, Pentax 645Z has a 51.0MP Medium format (44 x 33 mm ) sized CMOS sensor and features PRIME III processor. Pentax 645Z's sensor provides 30MP more than Nikon D5's sensor, which gives a significant advantage in real life. You can print your images larger or crop more freely. On the other hand, please keep in mind that Max sensor resolution is not the only determinant of resolving power. Factors such as the optical elements, low pass filter, pixel size and sensor technology also affects the final resolution of the captured image. Another difference between these two cameras is that Pentax 645Z's sensor lacks anti-alias (Low-Pass) filter. Removing anti-alias filter increases the sharpness and level of detail but at the same time, it increases the chance of moire occurring in certain scenes. 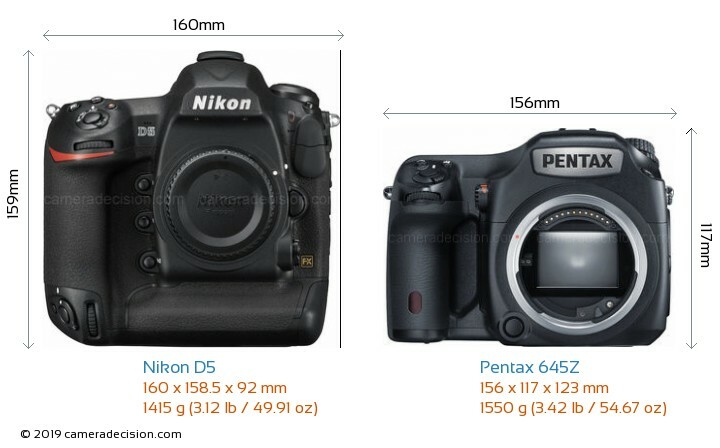 Below you can see the D5 and 645Z sensor size comparison. 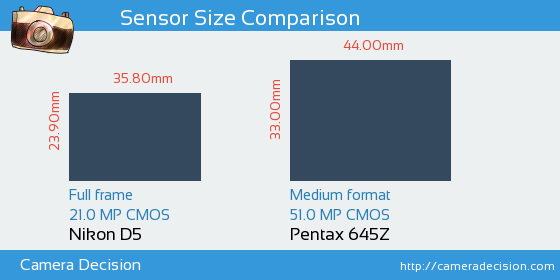 As seen above, Pentax 645Z has a 1.7x Larger sensor area than Nikon D5. Larger sensors give photographer more control on the depth of field and blurry background compared to smaller sensor when shot in same focal length and aperture. What types of Photography are Nikon D5 and Pentax 645Z Good for? In this section, we rank and compare Nikon D5 and Pentax 645Z for five different photography types in order to make your decision process easier in case you are specifically interested in one or more of these areas. Number of available lenses is a big decision factor while choosing your interchangeable lens camera. When we look at the available lenses for these two cameras, we see that Nikon D5 has an advantage over Pentax 645Z. There are 302 lenses for Nikon D5's Nikon F mount, on the other hand there are only 6 lenses for Pentax 645Z's Pentax 645AF2 lens mount. Another important factor is the availability of image stabilization. None of these bodies have sensor based image stabilization so you have to buy lenses with Optical stabilization feature. Currently there are 88 lenses for Nikon F mount and 2 lenses for Pentax 645AF2 mount with IS. You may have already made your decision about which camera suits better for your needs and your budget so far but in case you wonder how we rated Nikon D5 and Pentax 645Z, below you can find their scores in five different aspects. Our Decision Algorithm dynamically scores cameras using 63 different specs, current price and DxO Mark scores (where possible) in order to make a more objective and consistent comparison. Pentax 645Z has a higher Overall Score than the Nikon D5 mainly because of its huge advantage in Image quality. In all other areas, Nikon D5 excels. It is a tough choice! If image quality is your priority, get the Pentax 645Z.